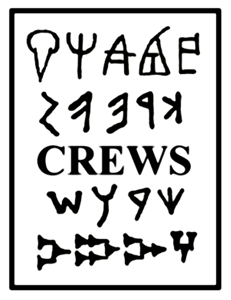 Anyone who’s followed the CREWS blog will know that we’re fond of a bit of sci-fi and fantasy. We’ve talked about the writing systems of Star Wars, Game of Thrones and Indiana Jones. But ever since I was a kid, my absolute favourite piece of science fiction has been Doctor Who. Since it’s finally back this weekend, what better time to look at how it handles writing? One of the topics that I have been working on a lot this year has been the development of the Punic script. This was the script used to write the variety of the Phoenician language spoken in the Western Mediterranean in the second half of the first millennium BC through to the early first millennium AD. It is descended from the Phoenician script, which was modified from an early alphabetic script to write the Phoenician language in the late second millennium BC. The Punic language is perhaps not that widely known among languages in the ancient world. However, its speakers, the Carthaginians, including among their number the general Hannibal who famously took his elephants over the Alps to attack the Romans, are. We’re big Star Wars fans here on the CREWS Project, and with a new film out now seems like a good time to revisit the topic of writing in the Star Wars galaxy. Pippa’s written before about Aurebesh, the most well-known Star Wars writing system, but as she mentioned in that post there are actually a lot more, and they’re a nice illustration of the changing way popular media uses writing-systems in its world-building. Earlier this week, Natalia’s post on Cypriots and Iberians told us a little about the Cypriot Syllabic script, which up to now has not featured very much on the CREWS blog. In fact, as someone who has been working on the languages and writing systems of ancient Cyprus for years, this is a subject close to my heart! In this post I wanted to pick up on the question of literacy in ancient Cyprus – and as you will see, the movements of Cypriot mercenary soldiers are an important part of the puzzle.